I’m continuing my quest to take the animals from my Arabic Alphabet Animal Poster and turn them into coloring sheets! Today’s work was the twenty eight letter of the alphabet: Ya (yā’), represented by Yusra the Yamam (dove in Arabic). Yusra is a wonderful moderator who always helps her friends come to a compromise. Other words that use Ya are yasar (left), yad (hand), and yowm (day). Last night I hosted book club at my home. We had spent the last month reading Dreamers of the Day by Mary Doria Russell and gathered to talk about it. Since we were traveling to the Middle East, I wanted to make an Arab soup to warm our bodies on a cold and wet November day. I couldn’t decide between an Egyptian Tomato and Chickpea Soup or a Palestinian Spinach and Lentil Soup, so I made both! Here is the recipe for one and tomorrow I’ll share my recipe for the other. So be sure to come back to this space! 1 – Heat oil in a saucepan over medium-high heat. Add garlic, red pepper flakes, coriander, salt, and caraway, and cook for 3 minutes until garlic starts to brown. 2 – Add chickpeas, tomatoes, red peppers, and stock. Simmer, stirring often, for 15 minutes. 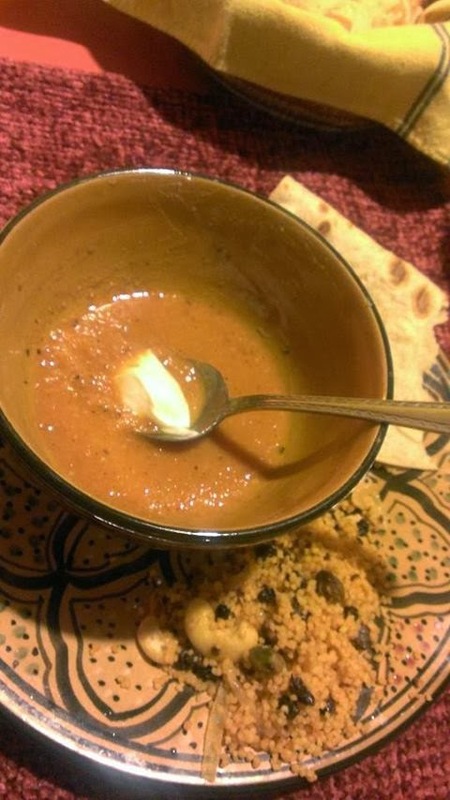 3 – Set the soup aside for a bit to allow it to cool slightly. 4 – Working in batches, puree soup in a food processor. 5 – If the soup has gotten too cold, warm it back up. Add a spoonful of sour cream in the middle for a bit of color and taste. Russell’s enjoyable latest historical is told in the exuberant, posthumous voice (yes, it’s narrated from the afterlife) of Agnes Shanklin, a 38-year-old schoolteacher from Cedar Glen, a town near Cleveland, Ohio. After the influenza epidemic of 1919 strikes down Agnes’s family, a childless and unmarried Agnes settles the family estate, acquires financial independence and adopts an affable dachshund named Rosie. 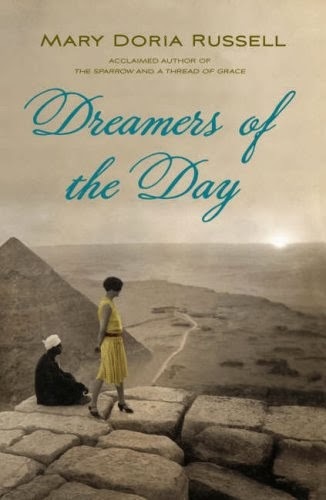 Accompanied by Rosie, Agnes travels to Cairo during the Cairo Peace Conference, where she befriends Winston Churchill and Lawrence of Arabia among other historical heavy hitters. She also falls in love with the charismatic Karl Weilbacher, a German spy whose interest in Agnes may have less to do with romance than Agnes will allow herself to believe. Agnes’s travelogues, while marvelously detailed, distract from the increasingly tense romantic play between Agnes and Karl. When a more worldly-wise Agnes returns home, her life—first as an investor wrecked by the Depression and then a librarian until her death in 1957—remains low-keyed. Though the bizarre, whimsical ending doesn’t quite gel, Russell (The Sparrow; A Thread of Grace) has created an instantly likable heroine whose unlikely adventures will keep readers hooked to the end.